Antonella Tuscan Tiramisu cream liqueur is a rich taupe liquid with a coffee nose, subtle undertones of biscuit, caramel and vanilla. This cream liqueur was inspired by the popular coffee flavoured Italian dessert - Tiramisu, which has the meaning "pick me up" or "lift me up". An indulgent cream tiramisu liqueur, inspired by the popular coffee flavoured Italian dessert. Antonella Tuscan tiramisu is the perfect uplifting treat to indulge your senses and transport you to la dolce vita. Spoil yourself with Antonella Tuscan Tiramisu cream liqueur as a dessert over ice cream; with coffee; as a Don Pedro or over ice. 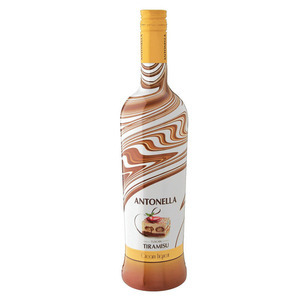 Look for the deliciously creamy Antonella Tuscan Tiramisu in 750ml bottles in liquor outlets around South Africa. Best enjoyed with friends so invite your friends over for a glass of Antonella Tiramisu.